Hello fellow readers! I am back... Taking a few days off from blogging makes me really miss posting! We still have a few more Fort Worth eats left so here we go... On one of the last few night in town Scott and I enjoyed a meal at one of our usual spots while working in Texas, The Tavern. Nothing is more fun than interactive meal. 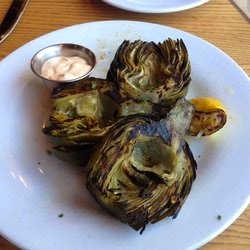 I like that Grilled Artichokes taste great but what I also love is that they take a while to eat. I like to linger over food rather than gorge it down quickly. That is why this is the perfect starter, food and entertainment. Crab Cakes, Cole Slaw and Mashed Potatoes?! Heck yes! I loved taking bites of the savory crab cake with fresh, crisp cole slaw and than alternating with the smooth, creamy potatoes. A feast for all the senses! I was seriously torn on what to order before settling on my order above. My other choice is exactly what Scott ordered! How funny, two peas in a pod! He got the the Zuni Chicken Salad with roasted chicken, chopped egg, julienned apples, pecans, goat cheese, golden raisins and tossed in a bacon vinaigrette. How delicious does that sound? If there was one complaint it was kind of a small salad for a dinner portion. They could double up on the fixings to make you feel like you had a meal. That is pretty much a wrap on Texas feasts... Time to get make to posting about California eats! Are you ready for more food? !